This easy origami hat is our adaptation of one in Origami by Toyoaki Kawai. Not only is it easy, but when made from newspaper, it's really cheap fun! We call it a "two-in-one" hat because you can wear it two ways for two totally different looks. All four hats in the photo are the same model. The only difference is the placement on the head. 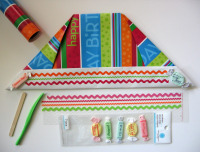 Folding and decorating origami hats makes a great party activity. Provide a variety of embellishments for your guests to decorate their hats. It's guaranteed to be a hit and a lot of laughs. Because this hat is so easy, in only a few minutes, you could pre-make a bunch of hats in various sizes and let your guests focus on decorating them. For young Ryan, age 4, we made a smaller hat from an 18" inch square. We provided Ryan with big Sharpie poster markers and a pre-made yellow morning glory. Grandpa was quick to grab a crane for his origami hat. A package of inexpensive feathers offered Mom the classy look she wanted. Over-achieving Dad made his hat from birthday-themed wrapping paper and decorated the edge with rub-ons, with help from Ryan. Seriously, wasn't Dad a good sport! Candies and plastic jewels to glue on are some other ideas. If money's no object, you can go wild providing various fancy items from the scrapbook section of your local craft store. A great alternative to newspaper and wrapping paper is white or colored banner paper available at most craft stores. This hat can be made from just about any kind of paper that is at least 18" on its shortest edge. A full sheet of newspaper (24" x 21¼) is perfect for adults. Cellophane tape is handy for repairing tears. 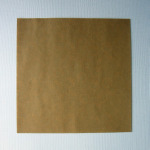 The paper can be square or rectangular. And, unlike most origami models, it doesn't have to be cut perfectly (if you need to cut it at all). For one of our workshops, we used French newspapers that were 23 x 13½ inches, like some community newspapers. This size required cutting to 18 x 13½, and a tweak to the base instructions, which we include in the steps below. You might prefer a hat like this. 1. The side of the paper that's down will be the main part of the hat. The side that's up will be the brim. 2. Fold in half, top to bottom. 3. If you are folding a full sheet of newspaper, skip this step. 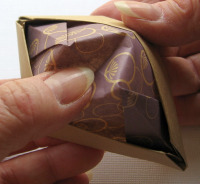 If you are folding a square piece of paper, fold in half again, side to side. Note: The only purpose of this crease is as a visual landmark. You'll probably find you can skip this step after you've made one hat. 4. Double-check the folded edge is at the top. If using newspaper, fold the two upper corners down until the lower edge of the folded piece is about 2¾ inches from the lower edge. This is easy to "eyeball" because the gap in the middle will also be about 2¾ inches. For square paper, the arrows are showing that the distance to the center crease and the distance to the lower edge should be about the same. Note: Actually, how far down you fold the corners is arbitrary. Play around and see what effect changing these folds has on the size and shape of the hat! For the smaller-sized French newspaper described in the introduction, we found we needed to fold all the way to the lower edge. Lift one triangle and run your finger or hand inside the pocket toward the point. On the outside, align the crease line with the folded edge (arrow), and press flat. Repeat on the second triangular flap. Tip: If you're having trouble with this step, practice making a square base. Task 2 of those instructions provides a detailed tutorial on this type of fold. 6. Turn the model over. Fold the two upper edges back on the existing crease lines. 7. Working with the lower left corner, peel up the top layer. Fold so that the edge indicated by the arrow is aligned with the folded edge underneath. Repeat on the other corner. Turn the model over and repeat on the other side. 8. Fold the top layer up as far as it will go, which is the widest part of the model. Crease well and unfold, allowing the two flaps marked with arrows to come down also. 9. Now you're going to form the brim of the hat in three folds. Finally, roll it up one more time on crease you made in Step 8. Three! Flip the model over and repeat. 10. Opening the hat will hold the brim in place, but a couple of tape "donuts" work nicely, too. Wear it peak-forward or sideways, with or without a dent in the top. 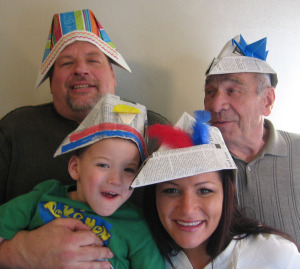 Have fun making origami hats at your next party!